I consistently feel led to be completely transparent, all the time. Lots of people argue against that; even using versus from scripture to prove we must be guarded. I don’t buy it and won’t in my lifetime. I would rather face Jesus and ask for forgiveness then be less than transparent with everyone. It grates my nerves when people are not transparent, or un-intimate and use the Bible as their reasoning. Maybe I am too transparent, well I err on the side of Christ. He makes caution unnecessary at times. I also know He promises to protect me so that I don’t need to waste my energy on that. I work for Beza International Ministries in Addis Ababa. I am committed to Beza Church. Beza took me under their wing and allowed me to work on the Change for Change Project. 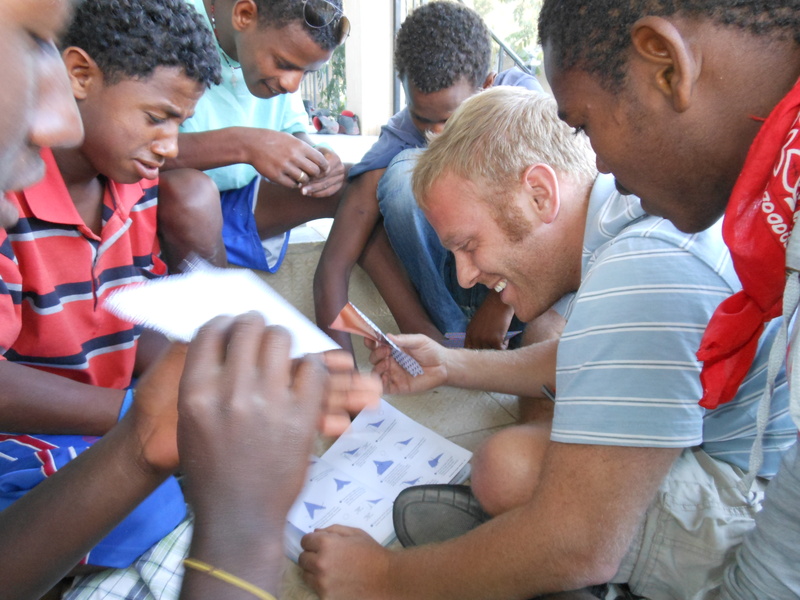 It was Pastor Z’s sermon that brought me to Ethiopia in the first place, it was Ben Piper’s sermon, Dr. Beta’s testimony, and the general feel/hospitality of Beza that encouraged me to sell all I have and move to Ethiopia to work with street boys. Beza like every church I have ever heard of does things that I don’t understand. I don’t need to; I am not called to understand everything under the sun. In fact, the less I understand, the greater God is. The more childlike my faith is, the more trust I need to have only in God. I have learned/grown at Beza and I respect their church model and vision. I 100% believe that building up street children is a huge piece, underrated piece, of “Redeeming Nations In Righteousness”. If I didn’t I wouldn’t be with Beza or in Africa. My spirituality has been unbelievably tested in Ethiopia. The consistent struggles of not understanding a different style of spirituality, a different culture, and a different style of relationships have grown me closer to God more than I could have imagined. I’m overjoyed to know these experiences have built my capacity for loving others to amazing heights. I also must say NCC is my spiritual family. I am committed to NCC. They are where I found church, God, serving others, was baptized, went on my first mission trip, and much more. Most of my support, growth, and friends are from NCC. It is their support and encouragement that has gotten me through some tough times. The serving children or poor piece of living in Africa, or the mission’s field is the EASIEST part. You never can imagine what other battles come your way. I expected the streets and the boys to be my struggle, but they have been my joy, my encouragement, my ability to quickly access the grace and wonderment of God. So.. To be completely transparent. It is a major struggle to adapt to different cultures, different spiritualities. So many people are thwarted by the differences or strife, which leads to a lack of unity among those who claim Christ as our savior. That’s not ok. I am thankful for Beza, NCC, Ethiopia and all the challenges that God is using to build me into a better man then I could have ever studied, worked, or served my way to!! That isn’t because its all rose petals, or because I am even good at handling all the differences. Im only thankful because of God’s willingness to use human idiocy to grow us into His servants. A bit preachy this morning, I know “boring, show me pics of those awesome boys of yours”. Well ok, but you are spoiled.I yearn for people to critique/audit/analyze me and my work and my words.. Please feel free! It sounds funny now, but as a kid I loved the soundtrack to the broadway show “Cats”. The song “Memories” was a particular favorite. How fortunate am I to have such warming, loving, family memories from childhood. It hurts my heart to ponder what kind of memories my boys most have from their youth. It angers me to now there are millions of children developing horrific childhood memories because we adults, fathers, families, Christians, Churches are failing miserably. 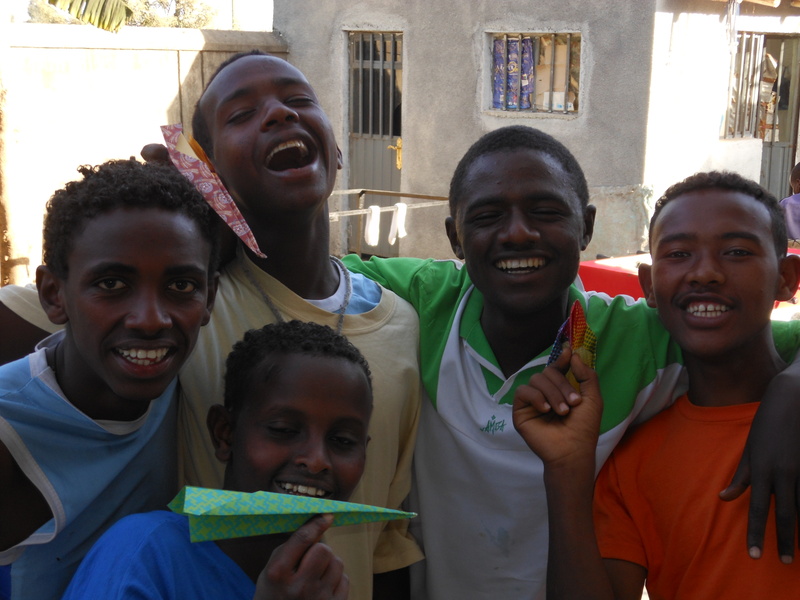 On different occasions I have almost tried to force new memories into our 16 Ethiopian young men’s heads. A couple of those memories I know have stuck and it surprises me sometimes all they can remember since the first day Birukti met them till now. Times like our first New Years, after being kicked out of our first house, or early days of me teaching them baseball, and so forth. This past Ethiopian Christmas or Gena was another chance to make indelible impressions on our boys. We had a ton of fun. First, our boys acted as volunteers that served about 80 kids during a Gena celebration at our sister org. The Entoto Mountain Project. They served food, organized the kids, MC’d some, and were a HUGE part of keeping the chaos limited. They are amazing with young children. Second, we had a creative fun day at our house. We had three stations of fun, creative type of play. It was a competition in which we divided them into 3 teams. We had a station that used an airplane kit to make paper airplanes. It was hilariouos, these planes were no joke, I couldn’t figure most of them out. Another station were 3D puzzles or wood models. These were hard too, but our boys did them very well. Finally, we had an art station where they were encouraged to draw, or create anything that was representative of Christmas for them. It was a great holiday of memory making. I am so thankful for these memories for myself, but also pray God uses these good times to encourage, grow, and help our boys in the future and the rest of their lives. With no concise way to share, I just want to give a recap of my time in America and the future of our house and boys. I have been back in Addis Ababa for three weeks now and am still experiencing the high from my trip. My main goals going home were to raise money for the project, discern what God’s will might be for me and the ministry, network, see friends and family, earn extra cash by working for old job, and get rejuvenated. Well…. CHECKS all around. Words can’t express my praise for Him. There was even a private God bonus that can’t quite be revealed yet. I must say that it was easily the best trip home I have had to date. I was blown away and at times overwhelmed by how God worked through my trip home. I sensed His Divinity at every bend. I spent the first 1.5 months home feeling lead to return to America after the boys graduate the house. Sometime in 2013. The purpose to explore starting a non profit, getting further education focused on building up street children, networking, and selfishly seeking more from my church and relationships like a wife. While preparing for the fundraiser God completely shifted my feelings, thoughts, or whatever they were. While I poured through pictures and videos of my boys, God’s voice was clear to me. “ Love you, love that you want to serve street children, you have many years to do that.. BUT THESE ARE THE BOYS I HAVE GIVEN YOU”. I found myself crying with joy while seeing the growth of my boys and knowing how God has miraculously done it all. Who am I to be a part of this? 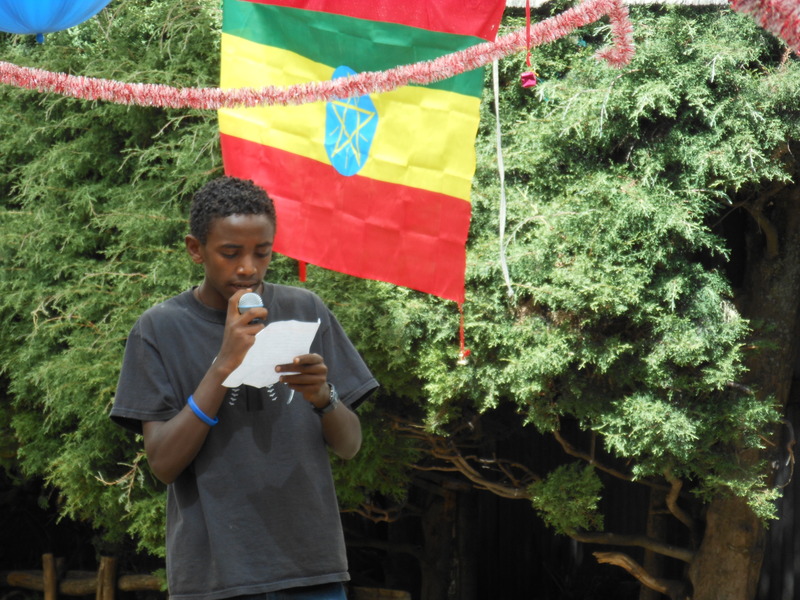 I have dreams beyond these boys, beyond Ethiopia, and beyond my ability. Clearly though, I must stay committed to these boys. Anything less is complete failure in my mind and dishonoring the call God gave me. My original commitment, though loosely stated, was 5-10 years. So, barring an irrefutable change by God, I feel lead to commit to these boys, Ethiopia, and this ministry through 2014 at the earliest. Our boys are supposed to graduate this house in September of this year. The “whats next” question is scary for all of us. Right now I feel pretty clear about chasing two paths. 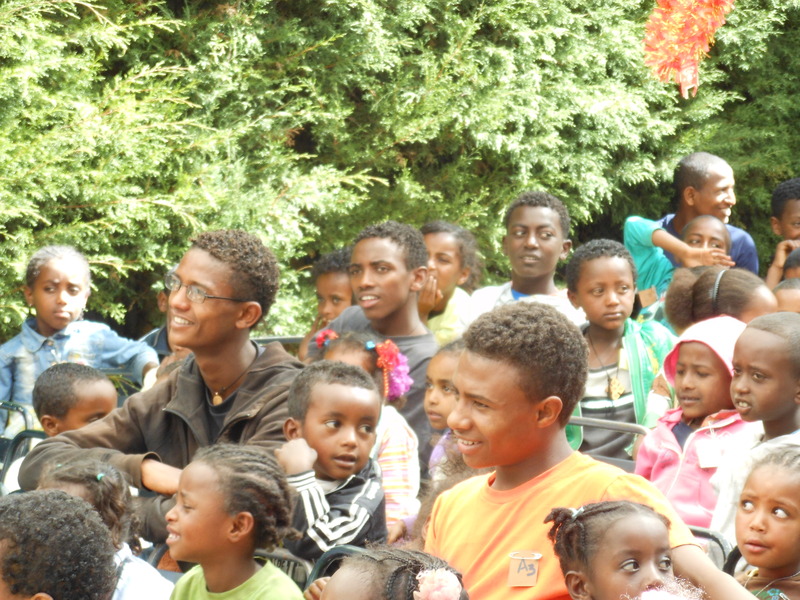 One is introducing long term foster care to Beza, and our community. The other path includes a vocational training initiative that includes some form of income generation. These are two major things that will require major miracles. These two options offer long term sustainability to our project and boys lives. They both have potential to be transferrable to With no concise way to share, I just want to give a recap of my time in America and the future of our house and boys. I have been back in Addis Ababa, for three weeks now and am still experiencing the high from my trip. This is where I/we are at today. So blessed by my trip home, so eager to see God do more miracles this year. We stay thirsty for the will of God and put that above all else. We know that telling God our plans makes Him laugh, so we wait with expectancy while taking every action possible. Being from the Philly area I like to self proclaim I “ keep it real”. Although I live an almost idealist life, I also like to consider myself a realist, which sometimes is another word for pessimist. One thing struck me hard this Christmas about “reality. I was severely moved during a Christmas Eve service that centered on the fact that God chose to send His sun to become flesh. Messy, gross, challenging, struggling, beautiful and REAL flesh. I immediately began to reflect on all the ways that Jesus is SO real in my life. I am so blessed to live a life that requires so much faith. The best part about that faith is my team, boys, and I get to witness Gods real work on a daily basis. There are so many things that have happened over the last two years that clearly were not be mans doing. So maybe I am not a “realist” anymore but a “miracle-ist”. So God is real and when I am focused on Him I do KEEP IT REAL!